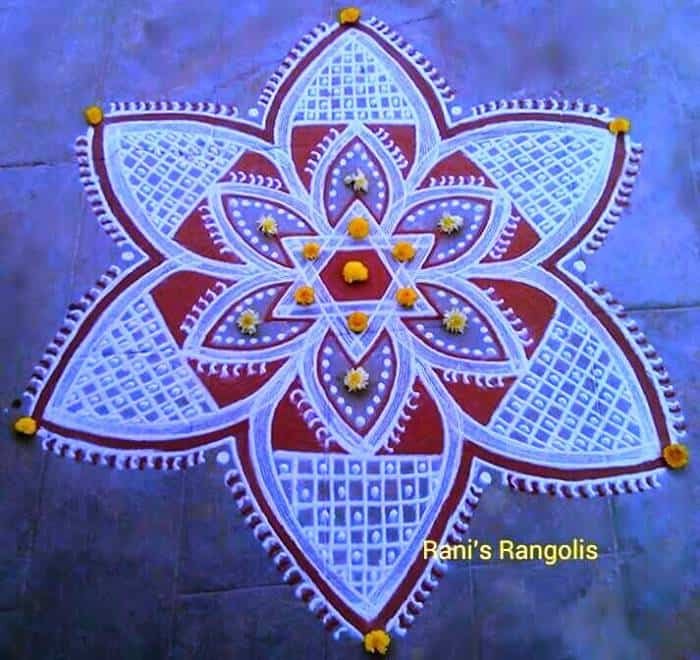 Kolam Rangoli designs are very much popular in the southern states of India. 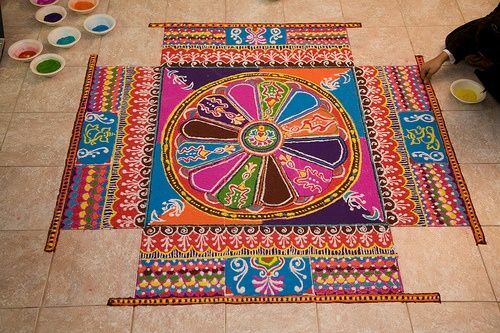 This is a beautiful floor decoration art which is mostly made during festivals and Pooja ceremonies. 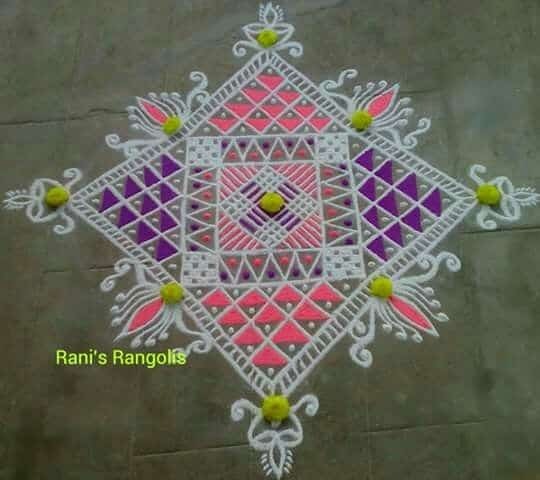 Traditionally, these Rangoli designs were made using rice powder, white rock powder and chalk. 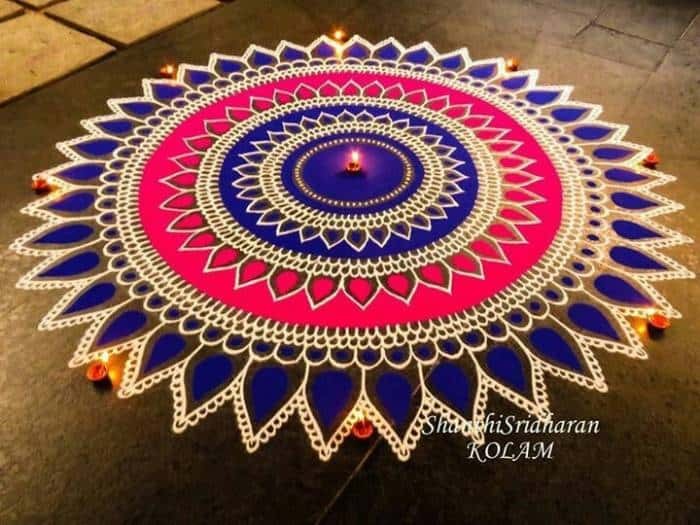 But these days you can also see colorful Kolam designs gaining popularity. 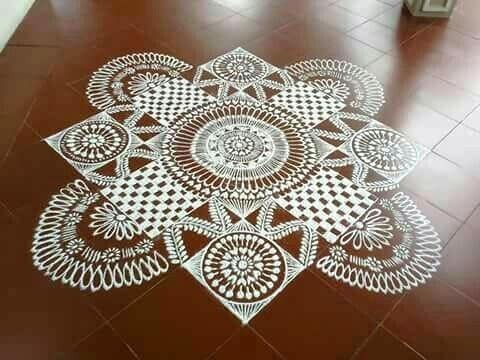 The beauty of this floor art is so intriguing that people from different places are interested in learning this floor art and using it for their home decor. 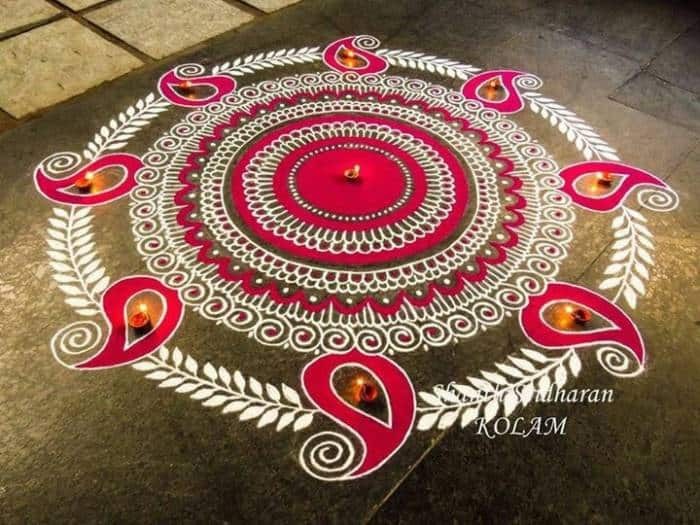 In this post we have compiled a list of 30 beautiful Kolam Rangoli designs that are sure to bring the best of your creativity. 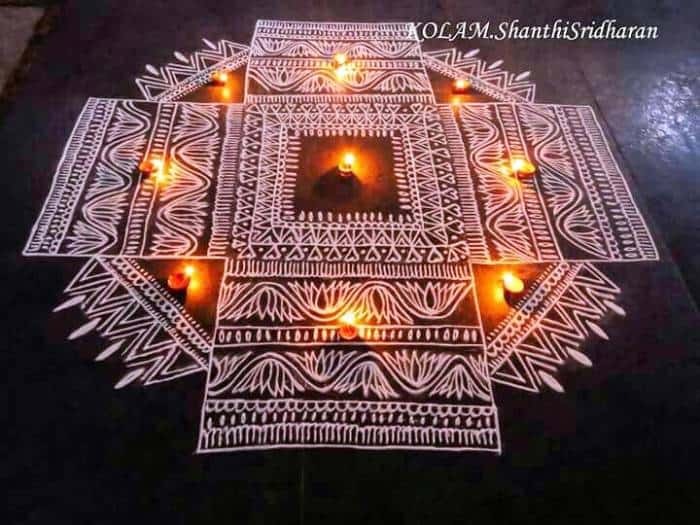 These images have been outsourced from well known Kolam design artists. 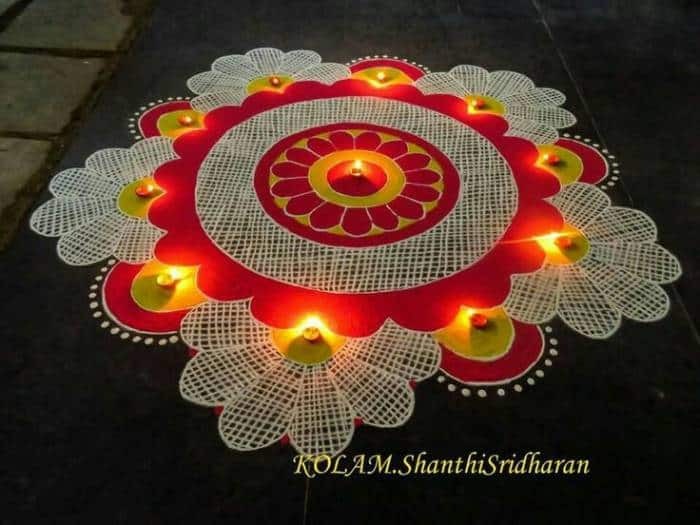 Let’s have a brief look at these Rangoli Kolams. 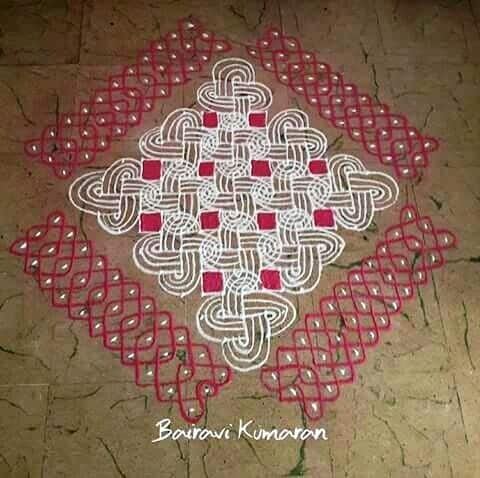 1: This beautiful Kolam design pattern is made by using white powder and is smartly highlighted by using red color at the base. You need to start this design by drawing square figure in the center and then making rectangular boxes at the four sides of the square. At the top of rectangular boxes you need to make semi circle structures. Once you are done with this outer layout, then you can easily fill it with fine lines and circles as a filler. 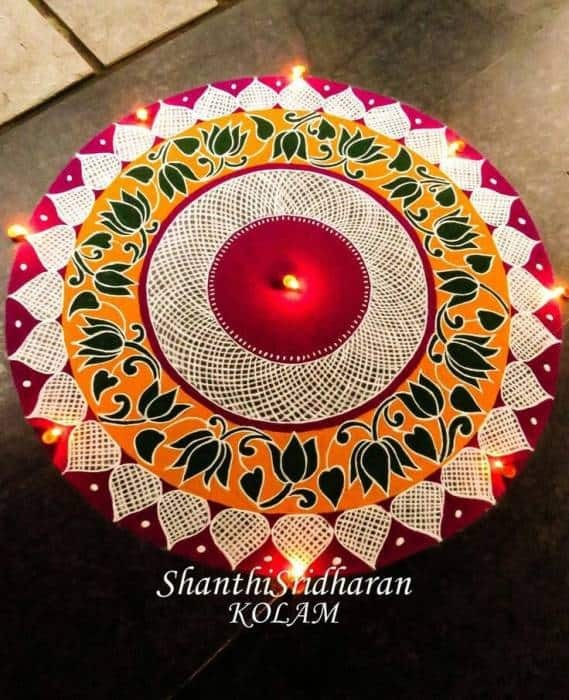 2: This kolam design is a blend of beautiful artwork and vibrant colors. 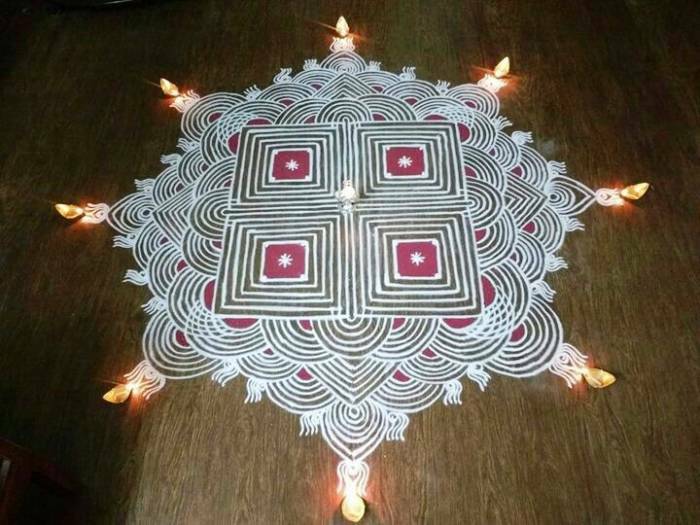 To make this Rangoli kolam pattern, you need to master free hand style of art to draw symmetric flower petals and earthen lamps. 3: It looks quite complex, but once you find that start point you can easily complete it. Here also you need to start with square shape and then again draw small squares at the corner of it. And in this way going towards outside complete the whole design. 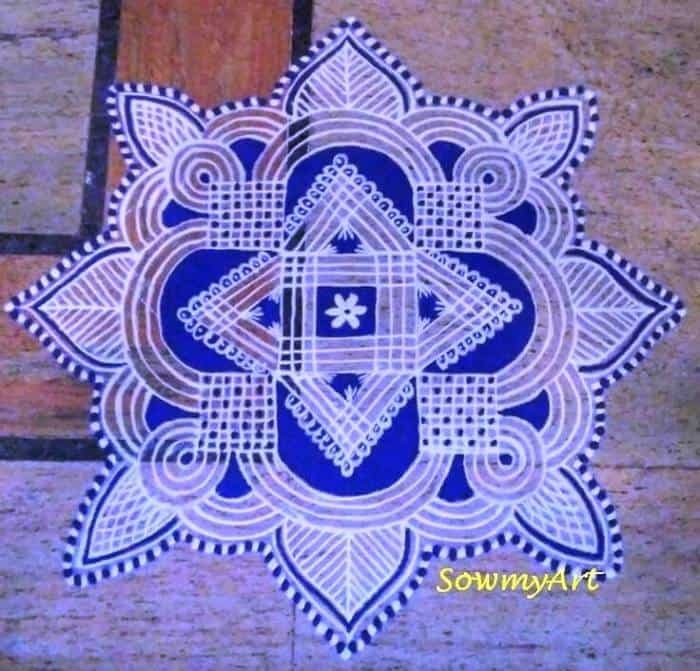 Then fill some parts with blue colored powder and then again use white powder to make filler designs. 4: Bored of those regular round shapes, then try this one. 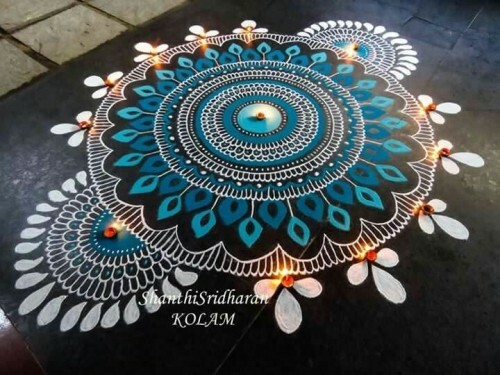 This unique kolam design looks so attractive and great pic for this festive season. 5: This complex looking design is created by using loops of fine lines. 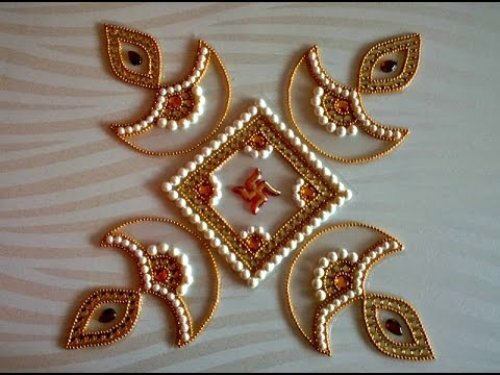 And to border it you can use any vibrant color which would bring out the design in a most beautiful way. 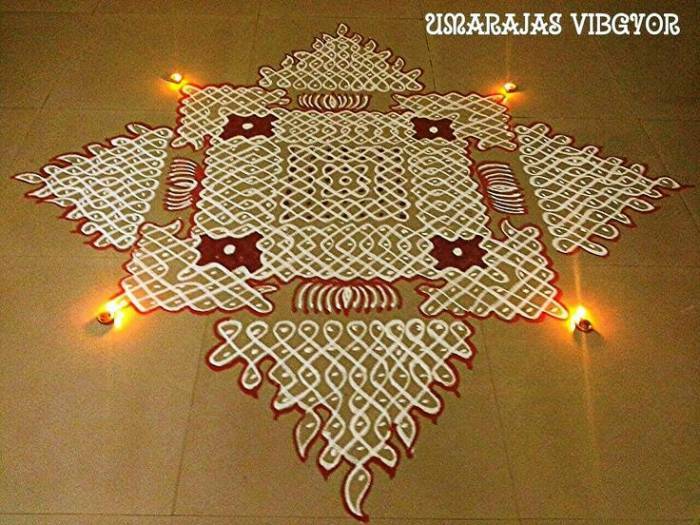 6: You can easily create this pattern by replicating the flower design and letting their corners meet each other. 7: White and pink works very well with each other and this proves it. 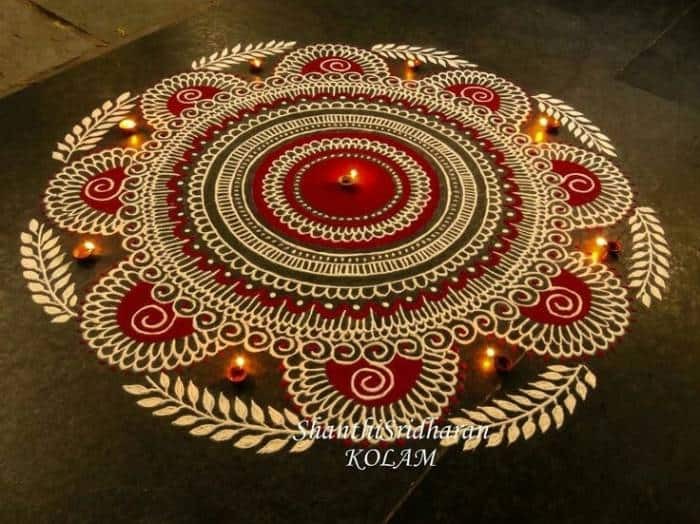 If you are a perfectionist of kolam Rangoli designs, then you can surely try your hands on it. 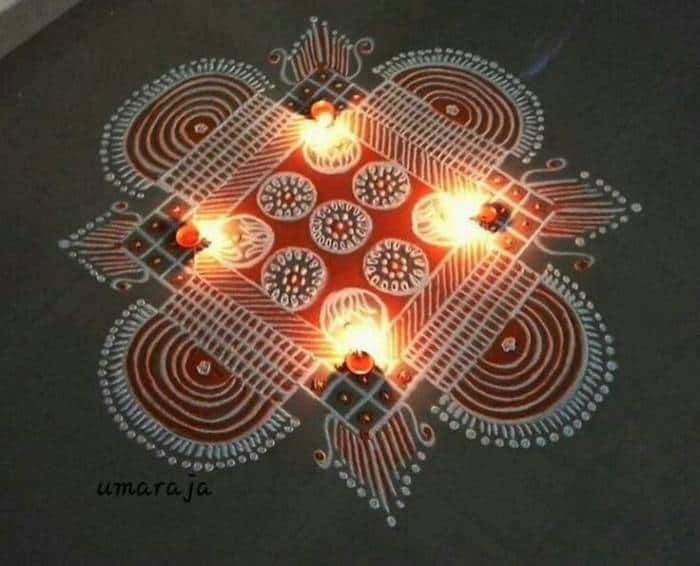 8: If you want to draw this neat design, then you need to make a paste of rice powder instead of using it in powder form. 9: After making square at the center you need to draw overlapped rectangular designs by figuring out their pattern. 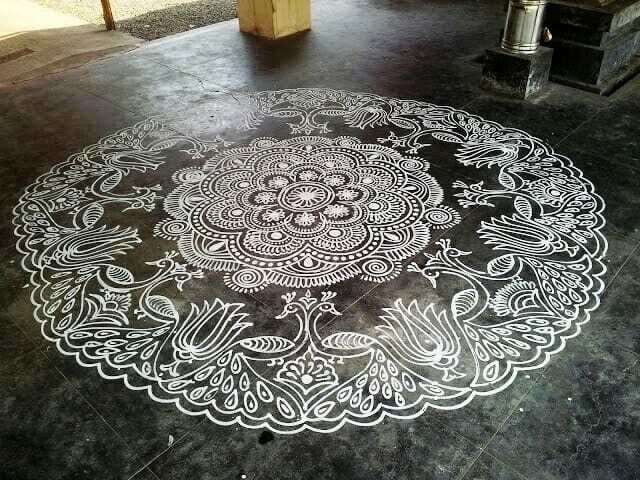 10: This elaborated kolam design can only be drawn by the artists who have mastered free hand style of drawing. 11: To make perfect circles, you can use circular disc as a reference and you can also use dot method for it. 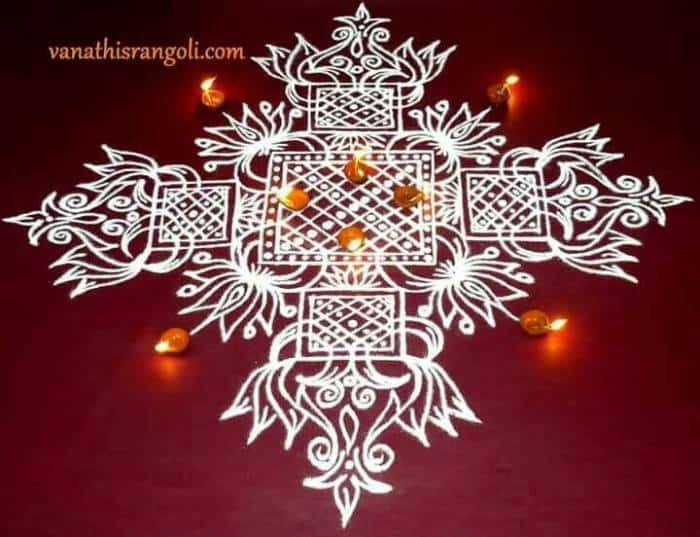 12: These kolam Rangoli designs are not merely art, but also have religious significance. 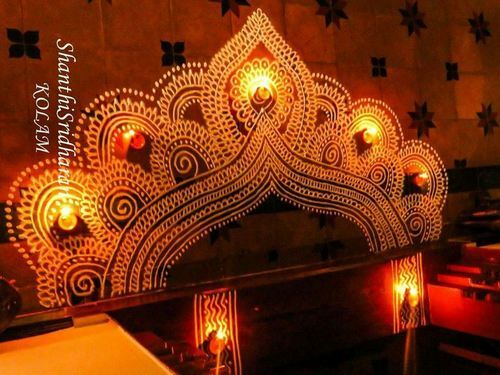 13: They are thought to bring good omen and prosperity into homes. 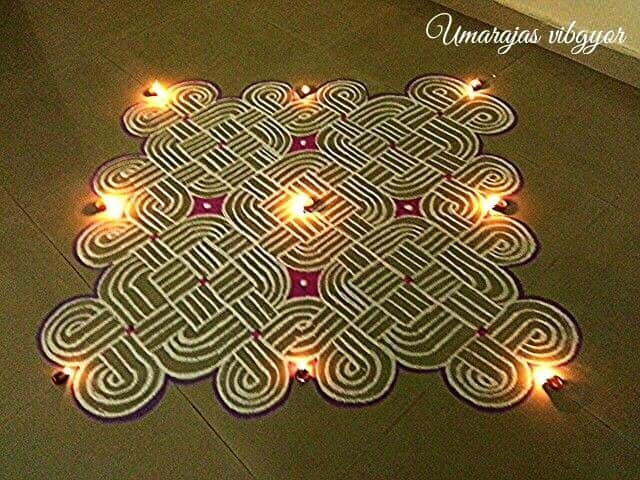 14: These overlapped patterns look quite complex, but once you figure out their pattern they become quite easy and quick to do. 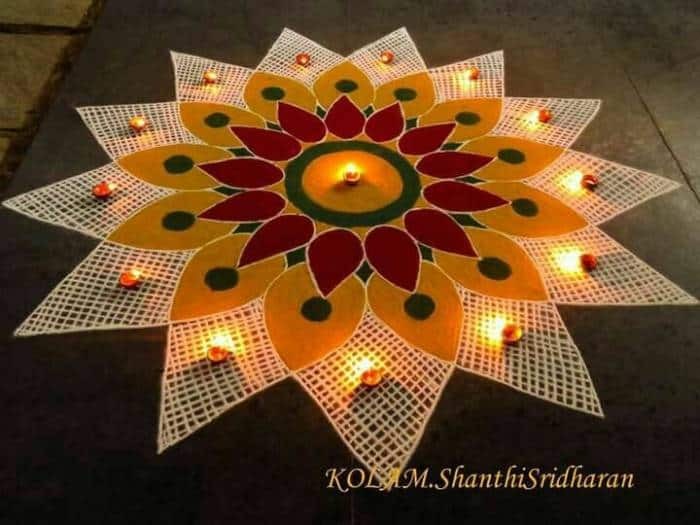 15: If you are looking for some great kolam Rangoli designs which should be easy to try but have a complex kind of look then have a look at this one. 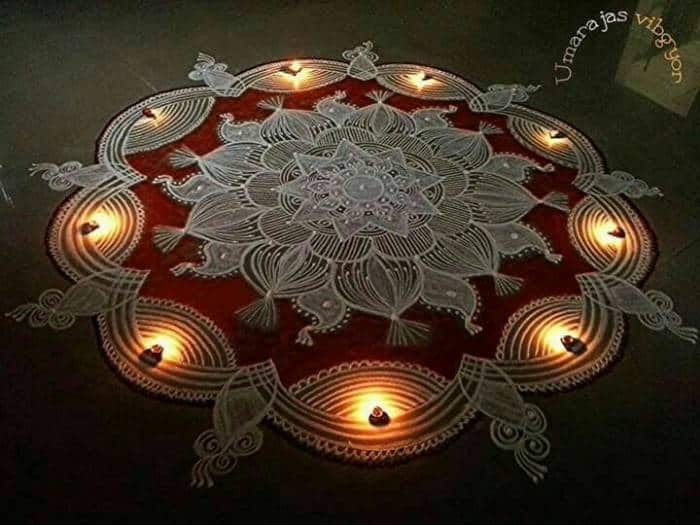 16: Beautiful kolam design for this festive season and don’t forget to decorate them with earthen lamps. 17: Beautiful use of florescent colors to give a pop up effect. 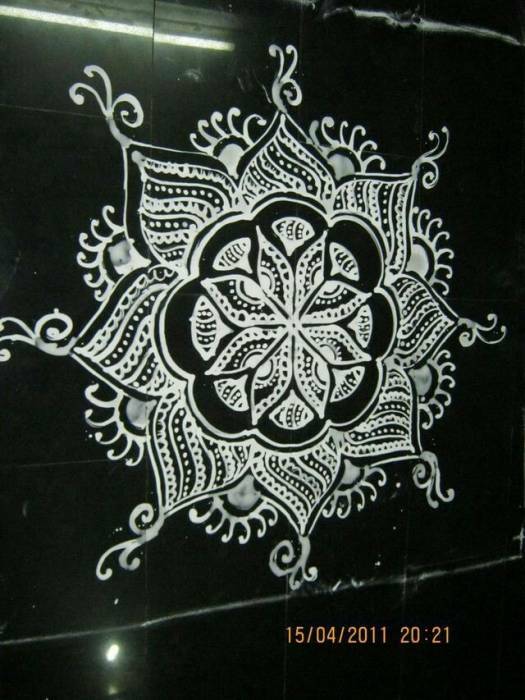 18: Kolam designs can also be made on the walls by using rice paste. 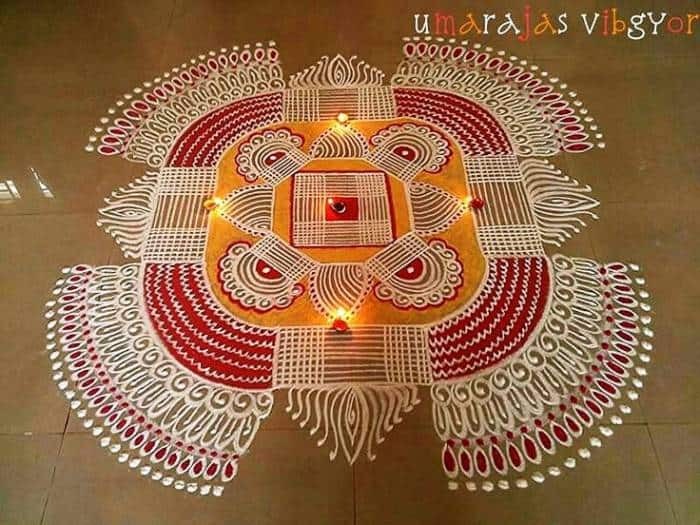 19: A person trying to make these intricate designs need to have lots of patience. As it requires huge investment of time. 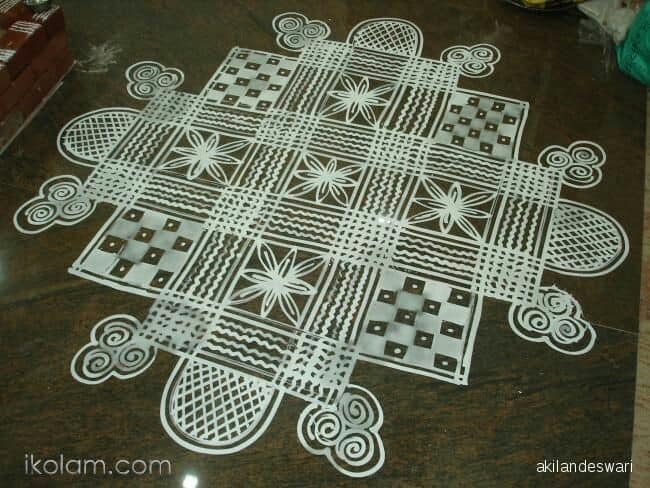 20: These checked patterns are a great filler to use in these kolam Rangoli designs. 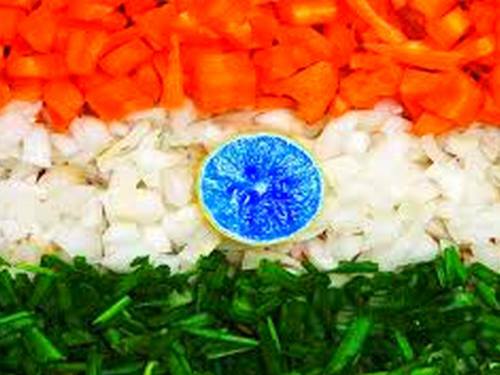 But one needs to be very careful, if not done neatly they may end up looking messy. 21: Creative design using the looped technique for the masters of this art. 22: Great one for the beginners with simple square, rectangular and circular design. 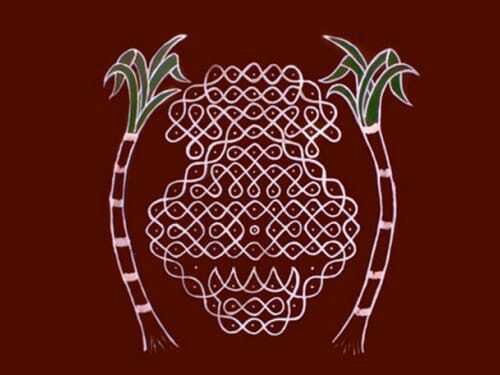 23: This quiet complex looking design is a simple one with straight lines connected using the free hand style. 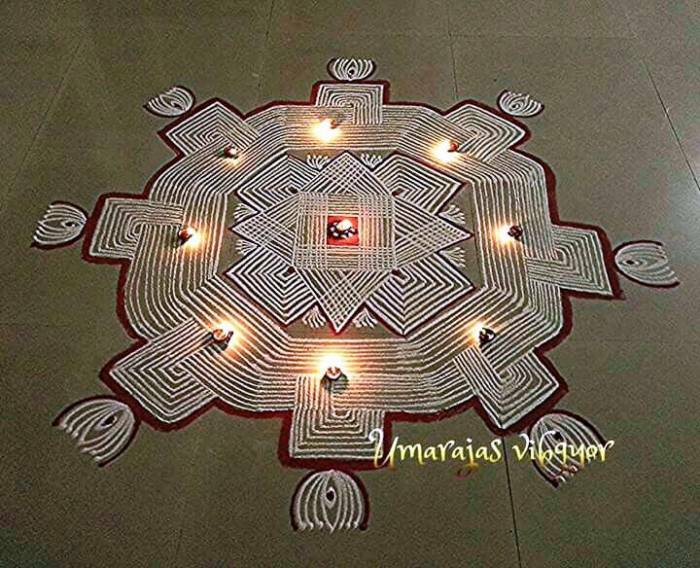 24: The footprints in the center represents goddess Lakshmi footprints and have great religious significance. 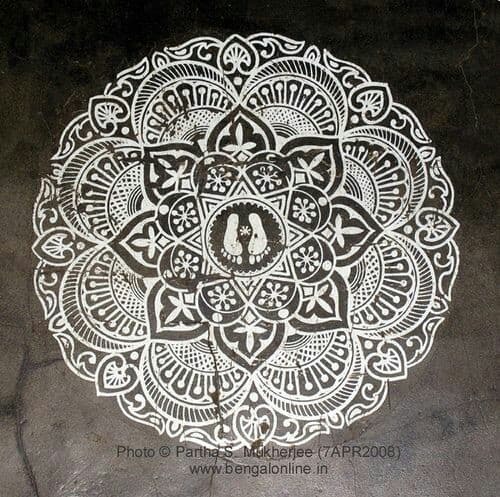 25: The utter elegance of this kolam design can inspire you to try this one even if you have no reasons for it. 26: Great artwork with beautiful use of bold colors. 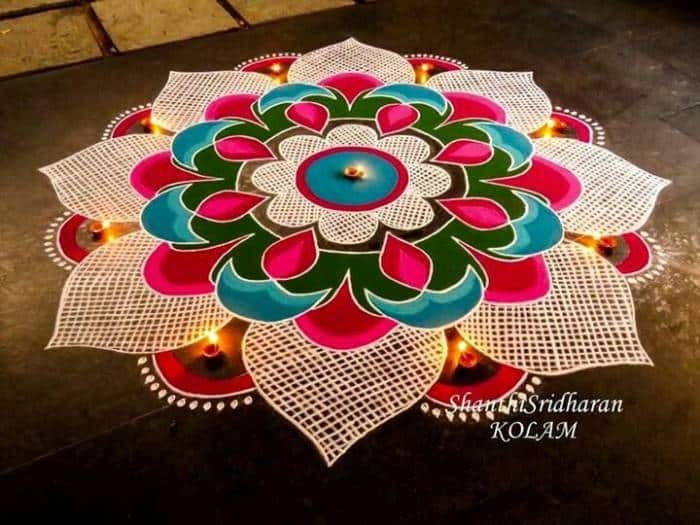 27: Many of the kolam Rangoli designs are needed to be drawn in a particular way, and are reserved for a particular occasion like holy rituals during wedding ceremony. 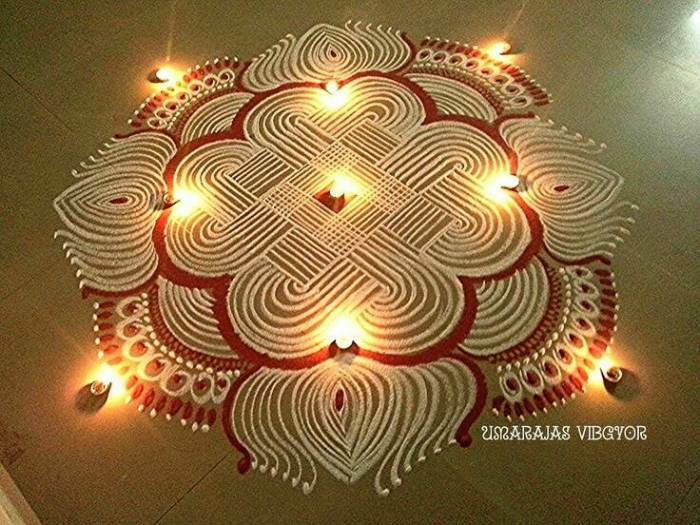 28: Lotus flowers are often used in these designs, they are the symbol for wealth and prosperity. 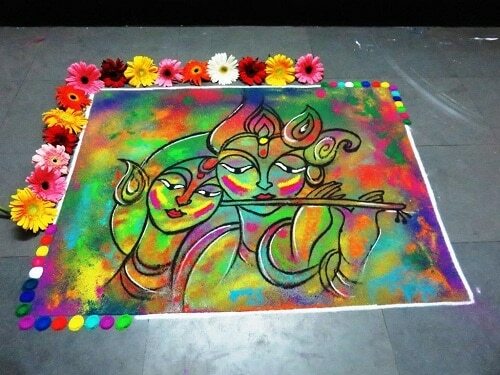 29: You can add some flowers to it, to decorate your kolam Rangoli design in a colorful way. 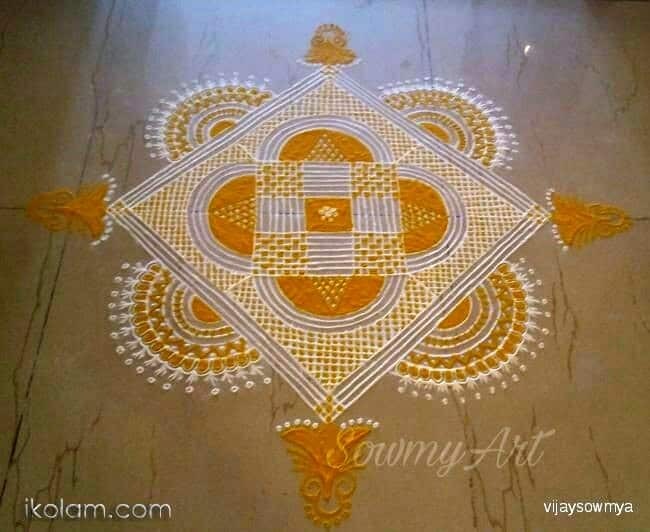 30: This spell bound creation is a great piece of art and a must try for all kolam lovers. 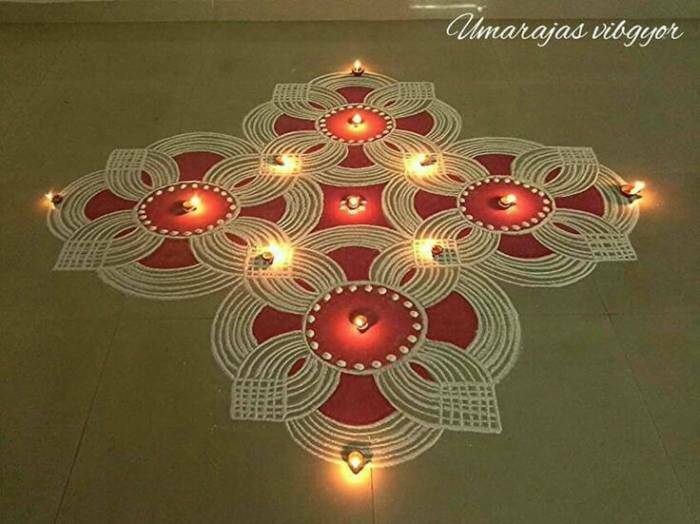 We hope you loved these beautiful Kolam Rangoli Designs and Kolam patterns. 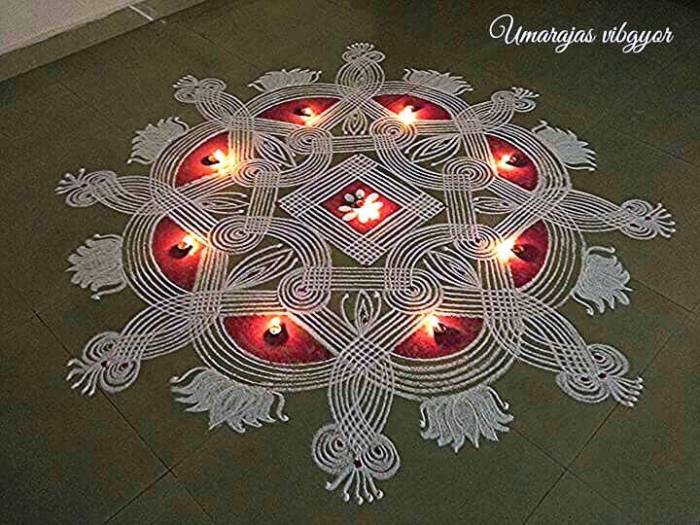 Also have a look at these Flower Rangoli Designs and Kolam rangoli designs for Pongal.